Durgasaptashati is a part of MarkanDeyapurANA comprising of 700 shlokAs categorized into 3 charitAs – each representing the battle between the divine and Asuric forces. The first charitA is devoted to mahAkAli, the second to mahAlakShmI and the third to mahAsaraswati. The first charitA represents the battle between mahAviShNu and madhu and kaitabhA with mahAkAli as mahAmAyA working from behind. 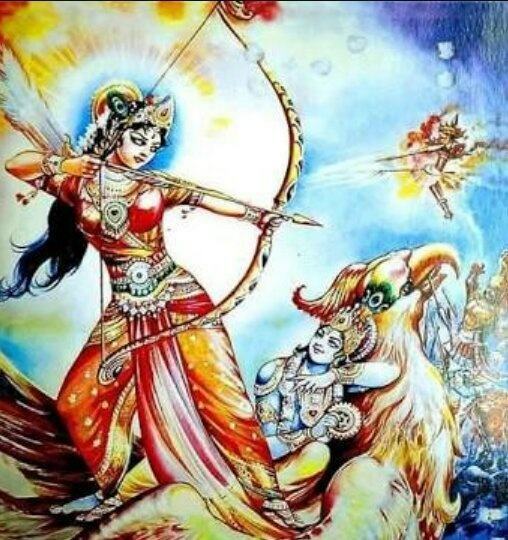 The second charitA talks about the fierce battle between mahAlakShmI and mahishAsurA. 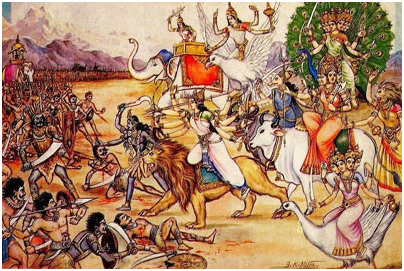 The third charitA deals with the battles between a multitude of asurAs and mahAsaraswatI. While the charitAs appear to be the story of the victory of good over evil and explains the various strategies used by the divine forces to win the battle, a deeper dive into the true meaning of the text reveals the truth of life and the struggle that is faced by each one of us in our daily lives. While on the surface level it appears as the friction between the dualisitic forces of life – the good and bad, the truth and false, the knowledge and ignorance, and immortality and death etc, the integration of the navAkSharI mantra along with the saptashaticharitrAs bring out the triputItatvAs of the existence – (create, sustain, destroy) or (brahmA, vishNu, shivA) or (rig, yajur, sAmA) or (agni, suryA, sOmA) or (mahAkAli, mahAlakshmI, mahAsaraswatI), or( jnAtrU, jnEyA, jnAnA) and so on. As explained earlier, the surface level dualistic forces seem to be obvious and apparent in our daily lives. For every divine thought, there seem to be an equal and opposite demonic thought that is inherent in life that pulls us in an opposite direction. This simple theory is established in the first chapter where the creation is established by viShnU’syOganidrA – a blissful state- A state of fullness and complete anandA. There is no creation at this state and when the first spandA happens and the creation is about to start, the creation of the demonic forces also occurs as a very natural event like a wax forming in the ear. The reason for using this analogy is simply to indicate that there is no need for any effort to be made for creation of these forces and they are inherently natural. Madhu as a nectar is represented as bahutvA meaning the desire to be many. KaitabhA is an insect represented as bahutvaAnandA meaning the joy in manifestation. Thus, when the first spandA happens to create, the desire to be many and the joy experienced during this manifestation are the fundamental emotions that can be expected. These are related as demonic forces and they were ready to even take over brahmA the creator – meaning brahmA would have been bonded by these emotions as well. These demonic forces have the same equal but opposite strength as divine. These two demonic forces are destroyed by mahAkAlI as the mahAmAyA. This is explained in the first charitA. The second charitA is the continuation of the demonic forces as the creation further evolves and the trigunAs are formed and embodied into the jIvAs. The various rajOgunAs of anger, lust, etc are strong enough to result in an exaggerated ego-sense onto the jIvA and this works to the distortion of the natural law of conception. This rajOgunA is represented by the asurA named mahiShAsurA, the representation of a buffalo relates to the rajOguna, and mahAlakShmI comes on a lion that represents the dharmic path and wins over the rajOgunAtmamahishAsurA. The third charitA represents the further continuation of the demonic forces as the creation continues. By this time, the jIvA has lost his own true identity and this is created by the demonic force called avidyA / ignorance. AvidyA is the equal and opposite force of the sarvajnA quality the parabrahmA. The work of avidyA on the jIvA over several births results in a smoky or obscured vision and this is represented by the demon called dhUmralOcanA. Destroying this takes just a “hUM” kArA by paradEvatA and this vanquishes the avidyA instantly and makes the inner light shine like a crystal. The next demonic force that came is Chanda and Munda represented by different schools of thoughts as rAga and dvEshA or pravitti and nivritti or tUlavidyA and mUlavidyA. The tUlavidyA and mUlavidyA represents the mulAdhArA and sahasrArachakrA and chAmunDA represents the dEvI that helps the kunDaliNI at the mUlAdhArA to reach the sahasrArA. The next demon is raktabIjA who represents the desire/thoughts to continue with one’s own identity. If the thought is destroyed or controlled, it manifests itself into multi-fold times. This demon is ably supported by his eight commorades – udyudhA ,kambu, kOtivIryA, dhaumrA, kAlakA, daurhrudA, mauryA and kAlakEyA. These demons are represented by the eight bondages that restrict the jIvA from attaining the supreme consciousness. These eight bondages are Ghrina (Hate), Lajja (Shame), Bhaya (Fear), Shankaa (Doubt), Jugupsaa (Reproach), Kula Abhimana (Caste), Jaati (Creed), and Sheela (Modesty). To control these ashtapAshAs, ashtamAtrukAs (brAhmI, mAhEshvarI, kaumArI, vaiShNavI, vArAhI, nArasimhI, mAhEndrI, and cAmuNDA) are maifested by the paradEvatA. These dEvatAs cut away the bondages, relieves that jIvAs from these bondages, and help him walk towards the path of self-realization. The next demon to face is nishumbA who is represented by the mamakArA (my-ness). Each one of us can relate in our lifetime to this demonic quality. We can literally see in a child’s growth that one of the first sentence spoken is “This is mine”. This my-ness is attached to the jIvA and seldom gets detached. This mamathA is a biggest culprit to restrict the jIvA to a limited vicious circle and stop from expanding. By cutting off the mamakArA, the jIvA is left with nothing but self that is the ahaM-kArA which is represented by the demonic force – shumbhA. Even though the jIvA has completely lost everything and is simply left with just the ahaM-kArA, this demonic force is enough to restrict the jIvA from walking the path towards jnAnA. This demonic force in turn brands the divine force as the egoistic force playing unfair games in the battle when the demonic force is reduced to just the ahamkArA whereas the divine force has totally manifested into multiple energies. The divine force then merges everything to one, proves that there is nothing else other than that, and asks the demonic force to shed the ego. In spite of this, the ahamkArA is strong enough to continue the battle until it is forcefully removed. While saptashati teaches the techniques of battling these internal demons of our life, the real beauty of this text is its intertwined nature with the navAkSharImantrA. A true sAdhakA need not know the techniques but just continue chanting the navAkSharImantrA graced by the GurunAthA and that is enough to cut through all the demonic force in action and can lead one to merge with Her. The Asuras of Devimahatmyam is very detailed although precise. It gives a birdview understand Saptasati. Please detail the entire Saptasati verses in the forth coming issues of Purnananda Lahari.